What an exciting year 2015 it was for peaches & mint, with weddings all around the globe, including magical destinations like Argentina or South Africa, but also many gorgeous places all over Europe: Switzerland, Germany, Portugal, Mallorca, Tuscany and Ireland to name a few of the beautiful spots my lovely clients have brought me to! I couldn’t feel more blessed to be doing this for a living and to be keeping the timeless beauty of film photography alive through my work. 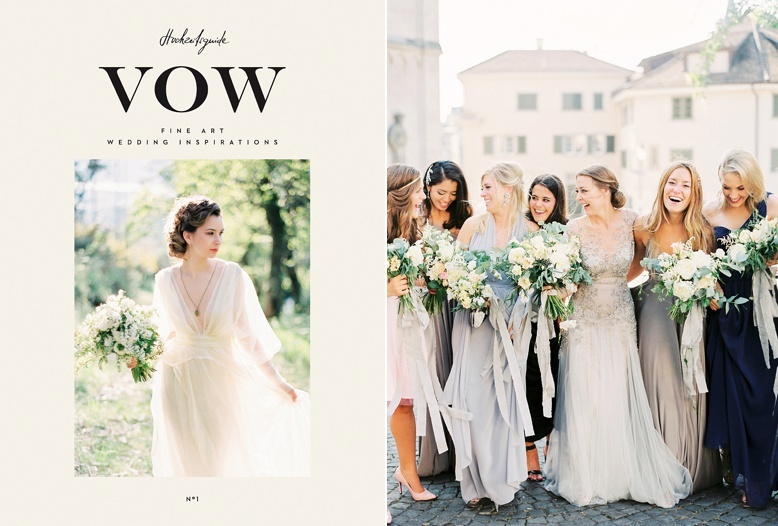 One of my favorite continental weddings and a true highlight of the past year has recently been published in the gorgeous Hochzeitsguide print Magazine VOW, alongside a stunning Olive Grove Wedding editorial, which I can’t wait to share with you guys! I take a little pride in the fact that it’s actually the only real wedding that made it into the magazine – because this is important to me: To make real people smile & glow, capture their spirits and make them look their very best in front of the lens! There are many gorgeous weddings & inspirations coming up on the the blog, so see you soon and meanwhile, wishing you all a very magical start for 2016! Cover image by my talented Portuguese colleagues & fellow film shooters Branco Prata. The bride’s wedding vendors included a stunning Inbal Dror wedding dress, floral art by Flowerup, bridesmaids in stunning grey Two Birds dresses, gorgeous Make-Up & Hair by Sinem Yavsaner, Frou Frou Chic ribbons, Gibson Bespoke & Melinda Rose headpieces, EmotionWorx video art and many more! You are so very right! I’m one of the people who has a styled shoot in there. And the one feature I keep coming back to is yours – seriously. Nothing beats the real smiles of those happy people – shot by you, of course!